22nd December, Riyadh: Shaker Al Hassan of United Arab Emirates won the final leg of the ABF Tour 2012 in the Kingdom of Saudi Arabia to book his spot in the Tournament of Champions in Kuwait next March. The Emirati denied challenger, Salem Al Hajras of Kuwait with a 175-150 victory in the all-lefty finals to earn the much needed 75 points to make the Top 16 cut in ninth position. Salem earned his chance to make the TOC after winning the ninth and tenth frame tie-breaker, 49-40 against another left-hander, Joshua Chow of Hong Kong in the second semi-final match. But opening two frames at the start of his match against Shaker did not help his chances. Shaker did have two open frames himself in the seventh and eighth but the Kuwaiti had two more opened frames eventually going down to Shaker, 150-175 and missed the top 16 cut in 19th position with only 60 points to add to the 31 he earned from the Bahrain leg. The champion breezed through to the finals after dispatching Mohammed Janahi of Bahrain, 191-156 in the other semi and confirmed his passage to the grand finals regardless of the final results of the title match. Apart from qualifying for the grand finals, Shaker was joined by three other late qualifiers. Joshua Chow, who finished third in this leg, earned 46 points to make the cut in 10th with 124 points. Mohammed Janahi, who took fourth spot, finished 11th in the rankings after earning 45 points. His compatriot, Masoud Saberi earned 32 points to finish 15th with 107 while the sole Kuwaiti in the TOC was Jassem Darwish on 101 points. Second seed, Ryan Lalisang of Indonesia was eliminated in the opening round after losing to Mohammed Janahi, 185-191 but earned 20 points to top the rankings with 197 points. Leader, Wu Siu Hong of Hong Kong, who did not participate in the tournament, finished second with 184. His compatriot, Wicky Yeung finished third with 167.5 points. The top 16 positions of the women's division was firmed by after the Indonesia leg in October. Julia Lam of Macau topped the standings with 105 points. 2010 Macau Leg champion, Putty Armein of Indonesia and Hong Kong's Milki Ng finished second and third with 100.5 and 99 points respectively. 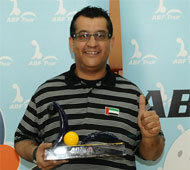 Mr Fahad Hamad Al-Issa, secretary general of Saudi Bowling Federation presented the trophy to the champion. This year's ABF Tour had four stops in the GCC for men only and four stops in Hong Kong, Indonesia, Macau and Thailand for men and women divisions. The ABF Tour Toournament of Champions will be held on March 11-12, 2013 at Cozmo Bowling Center in Kuwait in which the top 16 men and top 16 women will battle for the prestigious title once again.